For the 10th year in a row, we’ve visited the Bett Show at London’s Excel and were interested to notice a whole different vibe to Bett 2019. Despite the huge presence of interactive screen manufactures including Promethean, C-Touch and BenQ, we couldn’t help noticing the way technology for education is evolving in the direction of robotics, artificial intelligence and virtual reality. Coding is becoming a more consistent feature in the curriculum for IT and as such, robots are an aid to very quickly demonstrate to students, the results of their learning. It was fascinating to see this in action at Bett and witness the excitement of the students testing it out in real-time at the show. Artificial Intelligence (AI) goes hand in hand with robotics to make learning more engaging. Around every corner was a stand featuring tools for AI and virtual reality and we were offered many different opportunities to have a try. I can only imagine how different the educational landscape will look in a few short years when this new technology finds its way into each classroom. 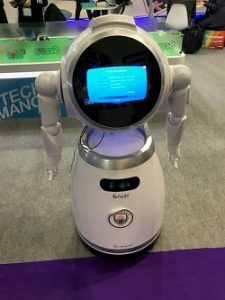 Education Secretary, Damian Hinds, who opened the show encouraged teachers to “embrace AI to help reduce their workloads.” I think that would be a welcome relief for many teachers and it’s exciting to see how it will unfold in the future. Damian Hinds also announced that there would be a £10 million innovation fund for edtech, which is really encouraging at this time of economic uncertainty. Noticing the increased footfall of children at the show demonstrates that the advancements in technology are clearly more engaging and are making learning more exciting for students. If technology is making learning fun, which therefore encourages greater academic achievements then I would say, it’s game, set and match for the latest technological developments. Since our very first visit to Bett over 10 years ago, we have seen a vast change in the presence of classroom hardware, where the interactive whiteboard (IWB) and projector solution dominated the show and the major leading brands were Promethean and SMART. As resellers and installers of this particular hardware, we can tell you from firsthand experience that the technology displayed at Bett 2019, has evolved so rapidly that projectors and IWBs have nearly all but been replaced by interactive LED touchscreen technology. 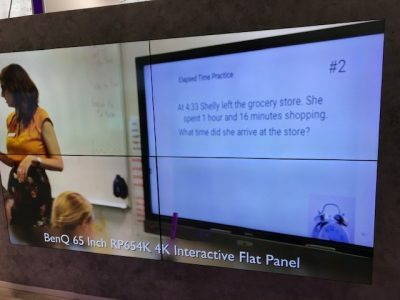 Releasing the need for multiple pieces of hardware to complete one solution, the market has been competitive and the increased presence of other brands at Bett in 2019, such as BenQ, Clevertouch and C-Touch was particularly notable. Without blowing our own trumpet so to speak (well maybe just a little bit), we received some excellent news while visiting the stand of one of our interactive touchscreen manufacturers, BenQ. 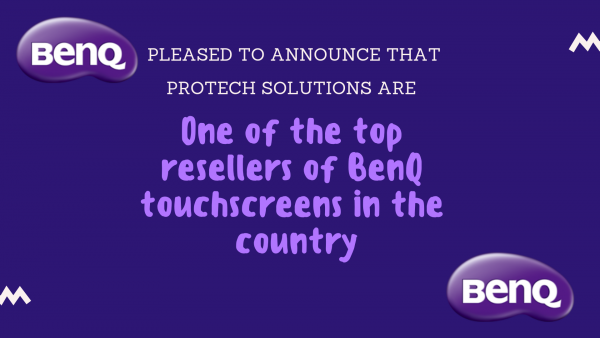 We were furnished with the news that for the past 12 month period, we were the 6th highest reseller of BenQ screens in the country (out of 213 resellers). Whilst we do consider this an achievement, we are fully aware that it is a testament to the quality of the product. With its impeccable track record of satisfied customers with zero returns from any of our end-users, we were not surprised by the news that we have sold more than our larger competitors. Of these sales, the number of 75-inch units has far outnumbered the number of 65-inch units. This upturn shows how the price of the larger units has reduced enough to come in line with the smaller screens. This means that schools are now able to upgrade their solutions to screens, which are closer in size to their old projection boards, which is great news for school budgets and the learning experience of the student. So, all in all, a very enlightening year at Bett. From dancing robots to 6-metre interactive touchscreen video walls, it was a feast for the eyes for even the biggest technophobe. Looking forward to next year.